The –v switch opens the interactive graphical viewer (cf. Fig. 1). In this mode the user can view the geometrical model, run or step through analysis, and view results. The right mouse click on the viewer window expands the menu. Fig. 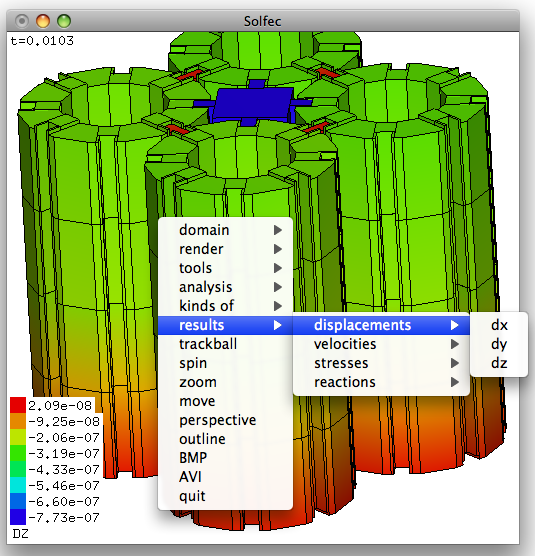 1 Solfec viewer window. and terminate in case you answered ‘n’. The –c switch forces the continued computation (write) mode: if some results are present, the analysis will be continued from where it was stopped. NOTE1: this option works correctly only if RUN is used once per input file; With –c Solfec terminates in case RUN is used multiple times; NOTE2: this option works only with the HDF5 output; in case of the XDR output it is the same as –w; NOTE3: in parallel, continuation must be done using the same number of MPI ranks (e.g. N in “mpirun –np N …” must not change). The –f switch, together with –v, opens the viewer in the wireframe mode, which requires substantially less memory and can be used to visualize large models. You can then use render \(\to\) 2D/3D wireframe selection option in order to selectively switch on volumetric rendering of selected areas of the model. The –g switch allows to specify the initial width and height of the viewer window (512 by default). This option may be useful in case you would like to generate videos with a specific resolution. During a parallel run Solfec updates a file named STATE, placed in the output directory of a simulation. It contains statistics relevant to the run, including an estimated time until the end of the simulation. The output directory contains as well a copy of the input file, which makes reading results more self-contained (it is harder to mismatch input and output files this way). An analysis (both serial and parallel) can be stopped at any time by placing a file named STOP in the output directory of a simulation. The -i switch allows to adjust the time interval of verbose output of runtime statistics (default is 1s). followed by setting up your model and ignoring all occurrences of the RUN command . For this approach to be robust, care needs to be taken to ensure that the input file can be correctly run from any location (e.g. access to additional data or scripts required by an input file needs to be suitably resolved). solfec–mpi always runs in the write mode. When viewer is used (–v switch), the execution of the input file stops at the first occurrence of the RUN command.